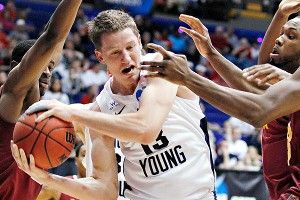 The BYU Cougars staged a furious comeback — the largest in NCAA tournament history — to erase a 25-point deficit and beat the Iona Gaels 78-72. “What a great night for Mormons!” said head coach Dave Rose. Meanwhile, Mitt Romney stood alone in the glow of a TV screen at his campaign headquarters, sipping a V8 and just grinning the biggest, saddest grin you’ve ever seen. In the other First Four game, Western Kentucky managed a comeback of its own, roaring back from 16 points down in the final five minutes to beat Mississippi Valley State 59-58. The Hilltoppers now advance to face top-seeded Kentucky in the next round, which may explain why their coach kept trying to send his confused walk-ons in during the critical run. Syracuse center Fab Melo has been ruled ineligible for the NCAA tournament as result of an unspecified infraction, dealing a huge blow to the Orange national title hopes. No word yet on the nature of the violation, since reporters, out of respect for Melo, didn’t do their homework. Patrick Patterson blocked Serge Ibaka’s shot with two seconds left as the Rockets beat the Thunder on the road 104-103. Normally Ibaka wouldn’t have been the one taking the final shot, but Kevin Durant and Russell Westbrook were having a poorly timed slap fight at half court. Meanwhile, the Bulls are looking to acquire Lakers forward Pau Gasol. “I told myself I’d see that big man dance before I died,” said Bulls head coach Tom Thibodeau, weirding everyone out. The Milwaukee Bucks traded Andrew Bogut and Stephen Jackson to the Golden State Warriors for Monta Ellis, Ekpe Udoh, and Kwame Brown. “We just wanted to see if anyone would notice,” explained someone from one of the teams, whose name is already lost to history. The Miami Dolphins traded wide receiver Brandon Marshall to the Bears for two future draft picks. Sources told the New York Post that last Sunday, Marshall punched a woman in a New York City nightclub, leaving her with a black eye. When the story came out, the Dolphins assured their distraught fans that they’d use the draft picks to acquire two more really crazy people.